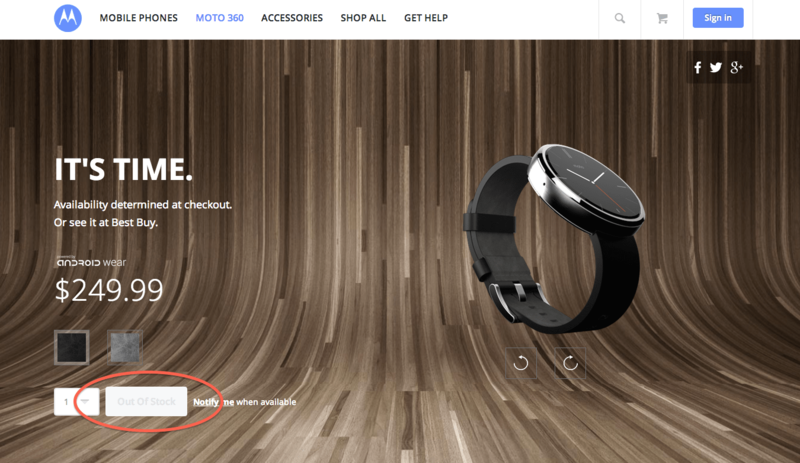 Moto 360 smart watch sells out before the first hour. What can we learn from this? That was quick! As soon as the Moto 360 smart watch went on sale it sold out. What does that tell us in the wearable world? That looks matter! I have been pounding on this point over and over again, and just yesterday when I wrote about the Samsung gear 2 s, looking better, but still needs to slim down. The Moto 360 is unique in that is a fully qualified smart watch, running Google wear, but its smaller, round and very attractive. A friend of mine whom I’m working with developing a news reader for the Google wear watches never liked the LG I got and I agreed that it looked bulky and unattractive. However, once she started using a smart watch, she came to realize what a number of us early Pebble adopters have known for awhile, a smart watch is not just an extension of your smart phone, but a means of reducing the number of interaction on the phone. Then she decided she wanted to 360. Didn’t get it. I touched on this briefly when I first got the Pebble; now that its more mature, and I moved to Android, I found the promise of reduced time on the smart phone has increased. I am very happy with the Pebble both because of its functionality and nice appearance. Something I have yet to see in another smart watch save the 360. And it seems I’m not the only one who things form does not follow function when its comes to wearables. Like anything else we wear, appearance and comfort DO matter. The selling out of the Moto 360 has proven that. I expect Samsung to follow up with a slimmer more mature design in 6 months.